Yesterday, I road-tripped it with my parents to visit my Big Bro and his family. I saw two of the munchkins before Christmas, but I hadn’t seen the other two since October. There are four in total. And I love them all. I’m still sorting through the hundreds of [blurry] photos I took but two of them caught my eye. More to come later, I’m sure. 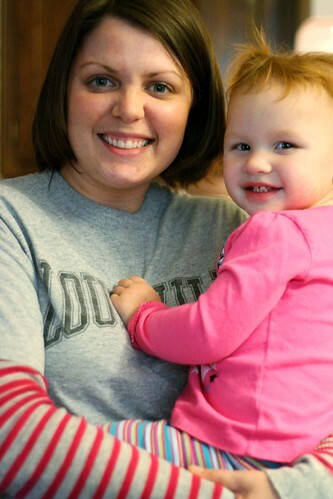 The Little Elf is a little over 2 years now and she’s a spitting image of my sister-inlaw. Bro loves to point out her ears because that’s the only thing we can tell on this child that he contributed to. But the Little Elf. She’s talking more now. And is funny. And I think we have a good thing brewing between us so far. This next photo was the highlight of my trip. I have never laughed so hard at a toddler. 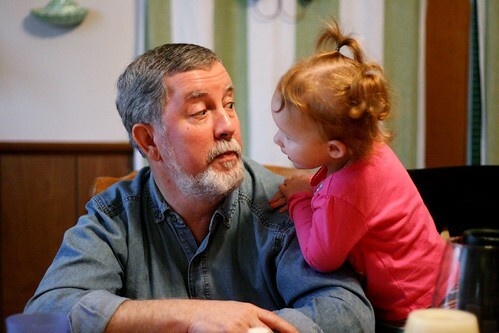 She’s standing in the chair next to DAd and was jabber-jabber-jabber-ing away, making absolutely zero sense but kept going on and on like she had the most important thing in the world to say. I think she’s mimicking Big Bro. But it was hilarious. It was a great day. I’m so lucky to be thrown in the mix with such a bunch of weirdos. ~ by shutterboo on January 17, 2010.